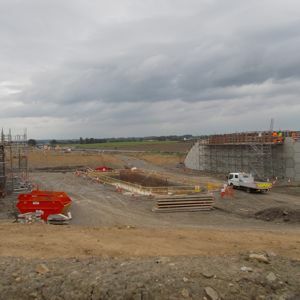 Construction of a new grade separated junction on the A1(M) upgrade between Leeming and Barton in Yorkshire. The Highways Agency (HA) has appointed 26 contracting and consultancy firms in four lots to its £5Bn Collaborative Delivery Framework. The framework will run over an initial four year period, with the option to extend this by another two years. Selected firms will provide construction works and engineering design services to aid delivery of the HA’s strategic investment programme. Contractors chosen to carry out high value construction with scheme values of between £100M and £450M (Lot 3B) are Balfour Beatty Civil Engineering, Bam Nuttall / Morgan Sindall JV, Carillion Construction, Costain and Skanska Construction UK. Amey LG, Galliford Try Infrastructure, Hochtief (UK) Construction, John Sisk & Son / Lagan Construction Group JV Kier Infrastructure and Vinci Constructio UK / Vinci Construction Grands Projects JV have qualified for Lot 3A. Firms in this lot will deliver construction works of value from £25M up to an initial £100M, which may be extended up to £300M. The HA invited firms to bid for places on the Collaborative Delivery Framework in March this year. Tender documentation said examples of the type of schemes to be commissioned through the agreement include the A14 Cambridge to Huntingdon, managed motorways, conventional schemes (such as widening and bypasses), junctions, ‘super pinch points’ and asset renewal works. The winners in Lot 1, to provide professional design and engineering services, are Amey, Arup, Atkins, CH2M Hill, Hyder Consulting (UK), Jacobs UK, Mott MacDonald / Grontmij JV, Mouchel, URS Infrastructure and Environment (UK), and WSP Civils / Parsons Brinkerhoff JV. These firms could get involved in everything from engineering design, traffic technology, traffic modelling, feasibility studies and preparation of required documentation and evidence under the framework agreement.